Toyota's youth-oriented sub-brand is put out of its misery. This August Toyota is killing Scion, its 13-year-old attempt at luring young people to then-staid Toyota. It sold more than a million cars in its life with offbeat models, youth-aimed marketing and a fresh retail environment. Scion’s cars and dealers are folding into Toyota’s, the automaker announced Wednesday. 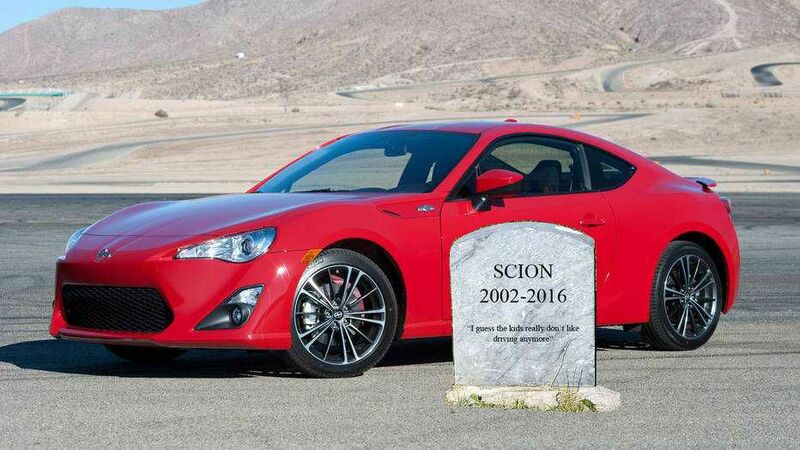 Scion’s first four years went well, but then its lineup withered, thanks largely to Toyota’s unintended-acceleration crisis and the global recession the following years. The company says another factor was young buyers’ attitudes towards Toyota -- it also shifted, making it a more aspirational brand than Scion. As Automotive News points out, shuttering Scion might cast it as a failure, but Toyota is in part vindicated in its efforts to strengthen its own image among young shoppers. Toyota’s plan is for a seamless, quick transition. Automotive News says the iA, iM and FR-S models will wear Toyota badges for the 2017 model year when they arrive in dealerships this August. The CH-R crossover concept from the 2015 LA auto show is going to hit the market in 2017 as a Toyota -- that was the intent for the rest of the world, anyway. We’ll see the production version at the Geneva motor show in a month. Toyota had already planned to whack Scion’s tC coupe after the 2016 model year. Bob Carter, senior vice president of operations for Toyota Motor Sales told Automotive News there’s no change to the customer. “We’re simply changing the brand and the logos,” he said. Toyota also said the move won’t mean any of its products are getting cut and that it won’t change its relationship with partners Mazda and Subaru; those continue as-is. Carter told Automotive News a fundamental shift in young buyers’ attitudes towards Toyota drove the move. He said while Gen Xers wouldn’t touch the same brand their parents and grandparents liked, Millennials see Toyota more favorably than they did Scion. “Today, youth buyers are in a completely different position than they were 13 years ago,” Carter told the paper. “That’s really what’s driving this decision.” He also conceded some younger buyers thought Scion was a lesser brand than Toyota, understandable considering Scions mostly sell for less than $22,000. , now is the right time to make this move.”The first Scions, the boxy xB hatchback and compact xA, launched in New York and California in 2003 and the brand went national in '04. The tC was added in 2006, the year sales peaked at 173,034.Investment in and attention to Scion’s lineup suffered during and after Toyota’s unintended-acceleration crisis and the recession. By 2010 sales bottomed at 45,678, or about a month and a half worth of Camrys. Adding the FR-S coupe co-developed with Subaru and the little iQ gave Scion some life two years later and in2015 the Mazda-built iA sedan and the iM hatchback arrived. Still, sales only hit 56,167. Killing Scion now might take some of the spotlight off lagging sales and negative attention every time sales numbers are announced. Toyota is notifying dealers today (Feb. 3), Carter said. Toyota says it already told the Scion and Toyota dealer councils, and they both supported the decision.“They understand what’s happening on their showroom floors,” Carter told the paper. “This just validated it.”Toyota is continuing to handle all warranty,financing and service work. The 1,004 dealers are all within existing Toyota stores. Get 'em while they last right!